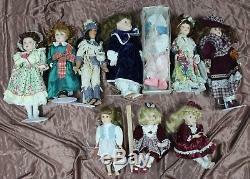 Lot of 68 Porcelain Dolls - Mostly Vintage - great lot for flea market, resale. Most of larger ones have stands. There's a handful that have damage, I set the ruler over them. Some of the brand names are Home Collectables Club, Collectors Choice, Crowne, Treasures in Lace, Signature Collection, Fancy Friends, Ashley Belle. WITHIN THE CONTINENTAL UNITED STATES. 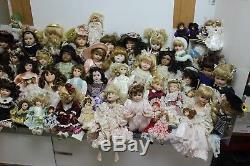 The item "Mixed Lot of 68 Porcelain Dolls & Stands Vintage to Modern" is in sale since Wednesday, June 13, 2018. This item is in the category "Dolls & Bears\Dolls\By Material\Porcelain\Contemporary (1980-Now)\Other Contemp. The seller is "wolves_stamps" and is located in Mount Gilead, Ohio.